Ken Burgin has been actively involved in hospitality for more than 25 years. First as the owner of Caffe Troppo in Sydney, and then working with restaurants, hotels and cafes in an advisory role. His resource website ProfitableHospitality.com is used by business owners and managers all around the world. Ken likes to use webinars and podcasts as another way to reach new and existing customers, backed up by active use of social media and an email newsletter. What’s make a podcast so much better for people? The importance of developing skill to be a good interviewer by asking really good questions and getting to the point really quickly. How to develop skills on podcasting? How to interrupt people who talk and answer too long? Why podcasting is hot all of a sudden since 2004? What’s the disadvantage of podcasting? 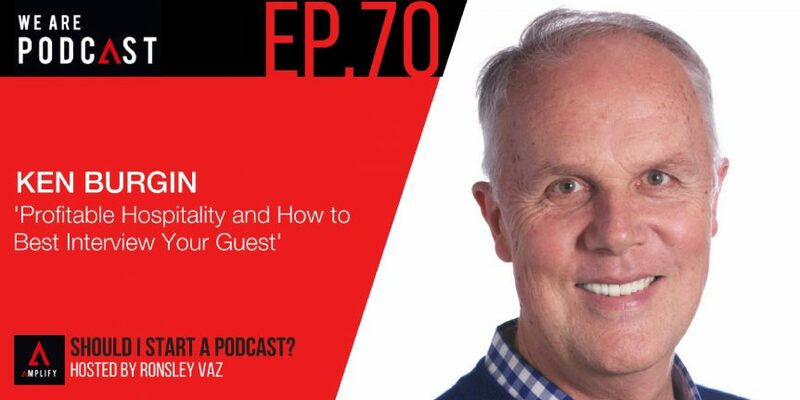 What can someone look forward to for Profitable Hospitality podcast? HOW COMPLICATED IS IT TO DO A PODCAST? I just love “So you want to be a photographer? Valerie Khoo and Gina Milicia. I really enjoy that. They got a love engaging, conversational topics. That’s good. But then I really interested in history. A wonderful one, BBC for 10 minutes of something that happened in history. Amazing. I have to confess I’ve never listened to Serial. Some I like Terry Gross, she does the Fresh Air. That’s the NPR one. It just a wonderful story. She interviews the most amazing people. The stories of their lives. And Richard Fidler. He’s a great interviewer and great to listen to his technique.